NOAA “state of the climate” report: Contiguous US average temperature plummeted 2.9F in 2013 | Watts Up With That? Hmmm, “the pause” seems to be stronger in the USA. Compare these two years. In 2013, the contiguous United States (CONUS) average temperature of 52.4°F was 0.3°F above the 20th century average, and tied with 1980 as the 37th warmest year in the 119-year period of record. The 2013 annual temperature marked the coolest year for the nation since 2009. The 2013 CONUS average temperature was 2.9°F cooler than the 2012 average temperature, which was the warmest year on record for the nation. Since 1895, when national temperature records began, the CONUS has observed a long-term temperature increase of about 0.13°F per decade. Precipitation averaged across the CONUS in 2013 was 31.17 inches, 2.03 inches above the 20th century average. This marked the 21st wettest year on record for the nation and the wettest since 2009. Compared to 2012, which was the 18th driest year on record, the CONUS was 4.50 inches wetter in 2013. Over the 119-year period of record, precipitation across the CONUS increased at an average rate of 0.17 inch per decade. January 16, 2014 in Climate News. NCDC omits inconvenient data in public climate releases? Hmmm, “the pause” seems to be stronger in the USA. Considering the known probems with NOAA temp station accuracies, anything they say that involves data over 20 yers old has to be considered highy suspect. The ranking map is a combination of weird numbers and colors. In 2013, the contiguous United States (CONUS) average temperature of 52.4°F was 0.3°F above the 20th century average, and tied with 1980 as the 37th warmest year in the 119-year period of record. So nothing special then. That wasn’t predicted. I guess they don’t have accurate models at a continental scale. But their seems to be no part of the contiguous United States that isn’t suffering some extreme. Simple question, did anyone predict those extremes? And if so how come they couldn’t predict the larger scale? Sorry, “their” should be “there”. “plummeted”? -2.9°F? 48 State Average? Where exactly is the average temperature located? Geographical center? Left Coast? Even in a turnaround on the warming thing, these numbers and terms look ridiculous. Yay the USA had weather in 2013! Whoda thunk it? Anyone with half a brain and no “education” that listens to their daily “climatic summary” on any local NOAA VHF Weather Radio, droning on and on with strings of useless data, can easily see none of this is abnormal. We’ve had a few “records” broken in SC, but the distribution of record highs and lows are still across the dates for 150 years. “The low today was 26. The record low of 12, was set in 1937.”….etc, etc., then they go back into guessing the wind and waves offshore, here in Charleston the sailors all ignore. My silly suggestions a live forecaster open a live microphone to interpret what the radar says, during bad weather and because the average clod has no idea how to read the NEXRAD display, goes ignored as that would require actual work at NWS. We like to use Celsius on the way up and farenheit on the way down. Careful. It’s been my observation over the last 40 years that when a cold, low pressure trough persistently hits the eastern 2/3rds of the US with winter storm after winter storm, the western 1/3rd is affected by a persistent, warm and dry, east Pacific high pressure ridge. The pattern illustrated above fits those observations. When the ridge-trough pattern shifts, the weather shifts. California could presently use a shift so that it can get some winter rains, and snow in its mountains, or it’s gonna be a bad year for agriculture and the overall cost of fruit and vegetables nationwide. You it is very difficult to predict when extremes will occur in a chaotic system. That is not to say chaotic systems are not predictable over a certain time scale, some are, but that time(max) for climate tends to be limited at 15 days. The Farmer’s Almanac however, predicts extreme snow events quite a long time in advance – the first Snowmaggedon is an example. It is also important to consider what ‘extreme’ means. The word is used to describe nearly every ‘large’ event even if it has been known to occur at a similar scale before. Soon we will be hearing about ‘extremely mild’ conditions and ‘extremely average temperatures’ (having lost all major swings away from some long term average or some such). People are going to extremes to call something ‘extreme’. What we now call ‘extreme blizzard conditions’ is what we used to call ‘winter’. In Australia it has been so hot in the past that birds fell dead from the sky. Now that summer bothers tennis players, it is ‘unprecedented’. I calculated the 2014 CONUS temp using USCRN to be slightly higher at 52.7F (but up to Dec 30thth only), while 2013 matched the NOAA report at 55.3F. Makes any 2012 CO2 link harder to make, a jump of 2F from 2011 to 2012, followed by a drop of 3F, just can’t be due to CO2. At Real Science NikFromNYC noted that skeptical seminars are full of seniors: they alone are old enough to remember hotter times. I replied: Also, senior citizens remember the storms. Looking back decades, seniors remember that it’s just the same now as it ever was, or it was hotter then. And stormier. It was hotter and stormier decades ago. There’s something totally afoul with the agw thesis, and with their data. Just because they manipulate their data to show that it’s hotter now than it was… doesn’t mean that that’s true. In addition, look at the adjustments. Seniors don’t notice any change. The only noteworthy change shows up because of their adjustments. As I also said on Real Science: And while the warmists may give a plausible basis for a particular adjustment, what doesn’t withstand any conceivable muster is that ALL THE ADJUSTMENTS BENEFIT THE WARMISTS! Not a single adjustment of any kind has ever been made to the benefit of our side. Oh, I know, it’s all about exaggerating the bull$hit. Al Gore says they need to “over-represent how dangerous it is.” Making any type of adjustment to the benefit of the “deniers” would be to under-represent how dangerous it is. So, as far as I now of, there have been no adjustments at all of that kind. None. Yes, the scare mongering Chicken Littles have over-represented the danger alright. Because there’s NO danger. It’s all disingenuous bs and flat out lies. Nothing more. The Prophets of Doom, to further their leftist agenda, have been trying to scare the people, and the children, for decades. It’s shameless, and probably criminal. Now we see that every single prediction of disaster they’ve ever made has not even come close to coming true. And that holds true for their laughable climate models. A complete joke. I go with the taxpayer funded satellite data instead. The station data in urban America is hopeless and so is the odd ranking map effort. BTW, did they not get the memo that blue is not allowed on thematic maps in the age of CAGW? Well, this is where an entire year becomes meaningless. We had a rather warm and pleasant spring and summer (above normal), but then the weather became less pleasant and cooler with more wind and rain this fall than in the past couple years … wind stirs up dust and by this winter, the cumulative effect meant I had to get to those windows and wash off the built-up dust … again. And the winter’s been more normal than the past two winters. We’re already ahead on snow for this season (over 60″ so far as opposed to a normal 49″ at this point in the season) compared to total snowfall for two winters that was less than a single season’s normal snowfall. Welcome to the 1880’s. Pull up a chair, sit a spell. It would be nice to see a series of maps showing the locations of th weather stations used to determine the average temp. of the CONUS every ten years. How has the coverage changed over the last 119 years. On another note the graphic showing the “Significant U.S. weather and Climate Events” is silly as there is no such thing as a “climate event.” Climate is the average and range of weather over a number of years. Cold events = weather; hot events = global warming/climate change. Now you are all scientists. The Circumpolar Vortex is slated to dip South again towards the end of January. That’s quite a record – 37th. warmest! One wonders if (by 2016) we might be experiencing the 120th. “warmest” year in 121 years. I recall learning something in statistics about “regression toward the mean,” and I suspect that without any outside influences what-so-ever, we can bet that it will get colder. We won’t even need the help of reduced solar forcing; we can just rely upon the law of averages. 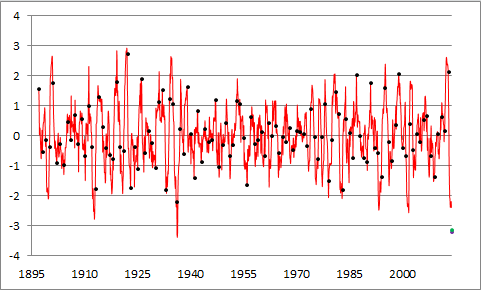 of differences of twelve month averages from the previous twelve month averages, in the USHCN record going back to 1895. The black dots are calender years. Ignore the green and purple, those were based on speculation about what temps December would have. Anyway, there would be a new black dot just over the -3 line on that chart if I made it today. As you can see, such a drop in temperature last occurred at the time of the peak of high temperatures in the US in the mid-thirties. Specifically, the record holder is April 1935-March 1936 relative to April 1934- March 1935, which saw a drop of ~3.39°F. This likely also represents the 3rd largest drop in the entire record. And it is *the* largest drop of a calender year. This really goes to show that far too much was made of the high temps of 2012. So by 2100 we will be a whole 1.1°F degree warmer? Wait until this years data. Trans-polar flow forecast across North America late Jan/Feb. …. But their seems to be no part of the contiguous United States that isn’t suffering some extreme. North Carolina had a lovely year. It was not hot, only three days of 90°F (32°C) and one @ 91° F and one @ 95°F (95°C) We also had no drought and my grass and white clover stayed green all summer. (“Wet” does not mean floods) However it was a bit chilly breaking record low minimums. So, let’s see if I got this right … the 20th century average temperature for the 48 contiguous states was 52.1°F, and the average temperature for the year 2013 was 0.3°F above that average, at 52.4°F. Wow!! It’s enough to make a person get soaked in sweat. Wait … was that 0.30°F or was it 0.32°F or maybe 0.34°F warmer. Nothing impresses like an increasing number of digits displayed after the decimal point. Maybe it was 0.30715°F warmer … now that’s really looking impressive!! Again the normal-vs.-average confusion: No one can say what “normal” weather is, since such a figure can’t be arrived at by experiment or observation or be decided upon by other factors. We know that normal human body temperature under certain conditions is 98.6 degrees F; we know that normal eyesight has been defined as 20/20; and there are other examples. But there is no normal weather or temperature, since it is a chaotic system, all of whose variables as yet cannot be known. All we have is average: the accumulated statistics (un-doctored, please!) from as long as they have been compiled, averaged over the number of years of the record (not just the selected 30 years, please!). We can certainly rank the periods under discussion if the records are substantially complete; but we cannot tell which, if any, of the periods is the “normal” one, because we are in no position to set a norm. Average is the correct, and justifiable, terminology. All that said, 2013 in Virginia was a cool, wet year, with about 10″ above average rainfall, no long periods of 90-degree highs (and only a few in all), and an early and chilly fall. On the whole, a pleasant year, though much harder to work outside during it–too wet, much of the time. Maybe all those CGAW alarmist should take off those gas mask to sequester their own CO2 emissions for a month or two. Are you sure NOAA didn’t just use the last election map for that graphic? I mean, it might as well be showing left vs. right… where the farther left a state is the redder it is. Maybe that incredible excessive heat is what is disrupting their thought processes. About 18 (?) months ago a WUWT thread dwelt on the choice by one of out govt. climate agencies to count “unusually mild” winters and summers as “extreme,” by which standard “extreme whether” is increasing, which is a form of equivocation, IMO. I share the same sentiment. My best guess is the 3rd winter, 2016/17. Yeah but the US is only like 1% OF THE earths surface. Remember that warm spot over Russia…. That graph shows great detail. Look at the phase changes it shows from one end to the other. From the early 40s till just past the mid 70s the climate registers as very stable. Then in the early 70s, the graph shows wider variations from year to year in temperature swings. This changes around 9 to10 years later and then both mini cycles repeat themselves again. You can see the very same set of minicycles prior to the early 40s period. What is causing that? The Rex Block has been incredibly persistent. The foot print is obvious, look at the map. Jetstream on January 21 Northern Hemisphere. See the from where the air reach the Great Lakes in the U.S.. I saw a comment about Australia & our heatwave and it reminded me of our poetry and the works of Henry Lawson etc. There’s always been heatwaves and bushfires which gave inspiration to our outbreak poets. As for birds dying, it’s the bats or flying foxes which have been dying, 100,000+ but there are literally millions! Also, I went out & photographed the king tide couple of weeks ago. No sea level change here. Hervey Bay Queensland is in fine shape. The planet has been here for millions of years, and man has been on the planet for a tiny fraction of that time. Furthermore, man has been recording and taking notice of the climate for a brief finger snap of that tiny fraction. Suddenly, people calling themselves climatologists are claiming that they can see trends in the world climate? Worse, the perceived culprit is a naturally occurring gas which is essential to the survival of every green growing thing in the world; and therefore essential to life itself! I won’t ask who are they kidding, because they appear to be successfully kidding the majority of us. But not me. I wonder what it’s like to live your life in fear of weather. Edgar Rice Burroughs set one of his ‘Tarzan’ series in Australia, if I remember right. In the story all of the natural forces of Australia come into play, a huge rolling flood crossing a plain, bushfires, and an extreme heat event. I have always been a AGW sceptic (English, and therefore correct, spelling) . . . .
Really? Who is pointing the gun at you? I would inform the police if that was happening to me. I never correct anyone who just spells the word as “Sceptic”; that’s natural in many countries. I only do so to counter posters who claim their spelling is the correct one, as above, because that challenging (and misleading) statement invites a rebuttal. All I know its been unseasonably cold here in North Texas. @goldminor-I have no idea, presumably it’s a natural phenomenon, though.